Bruisyard Hall - Open Day, 2018. 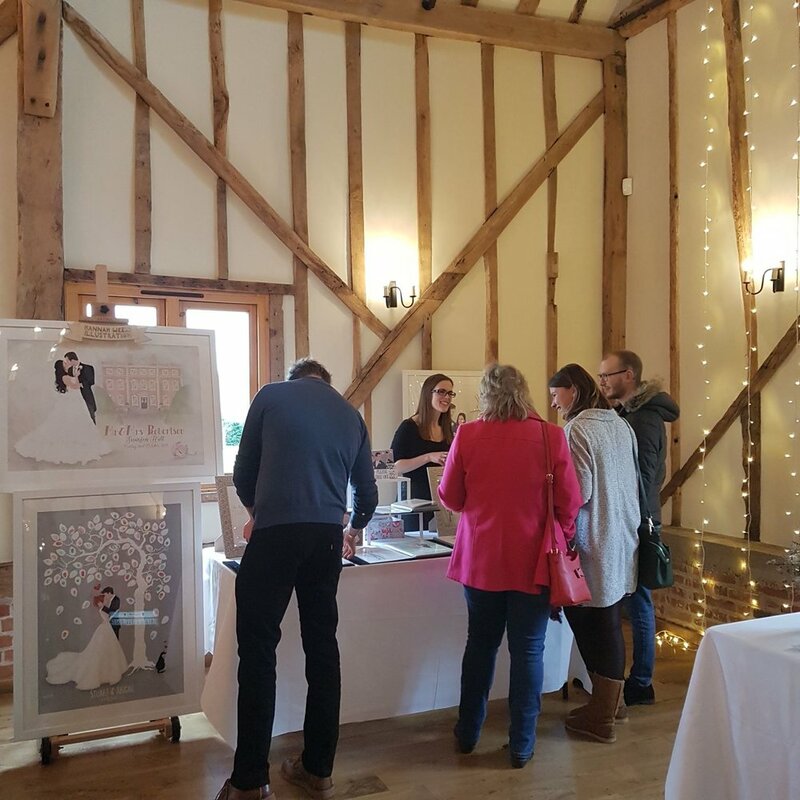 This Sunday, I journeyed to nearby Bruisyard village in Suffolk – to be part of the very beautiful Bruisyard Hall and Barn's open day. What a wonderful wedding fair to kick-start my year! 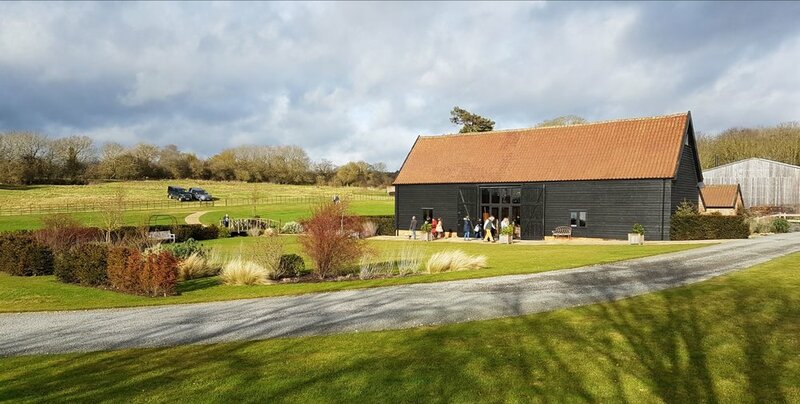 There is a choice of places to marry at Bruisyard, both set in 700 acres of quintessential Suffolk countryside. There's the hall itself, which is a stunning country house that sleeps twenty-four, and a beautifully refurbished, medieval barn. It's an absolutely idyllic place to get married. Bride and groom-to-bes were welcomed to take their time looking around the hall and grounds, and meet and talk to myself and the other wedding suppliers in the barn, which had been beautifully dressed in fairy and festoon lights by Dreamwave Events. I had a lovely space to display my illustrations, with lots of natural light next to a window. I always love getting everything laid out, and displaying my portfolio books. It's only at fairs like these that I see a lot of my work all together, and I feel incredibly proud of how far I've come over the years of being self-employed. I'm so lucky that I've been asked to draw so many of you. I also had a lovely neighbour on the stall next to meet - Frances of Moat Farm Flowers. Her floral arrangements are so pretty, and all the flowers she uses are grown on their farm just down the road – so that means very few 'flower miles'. Once set up, I was ready to meet everyone who had either booked their wedding at the barn already or were interested in getting married there, but hadn't yet made a booking. It is always so lovely to chat to the happy couples who come to my table. They're often at very different stages of their wedding planing – some are ready to go with just a few loose ends to tie up, others still needed to set a date. Absolutely everyone I spoke to loved the venue (as do I), and seemed very excited to be there. 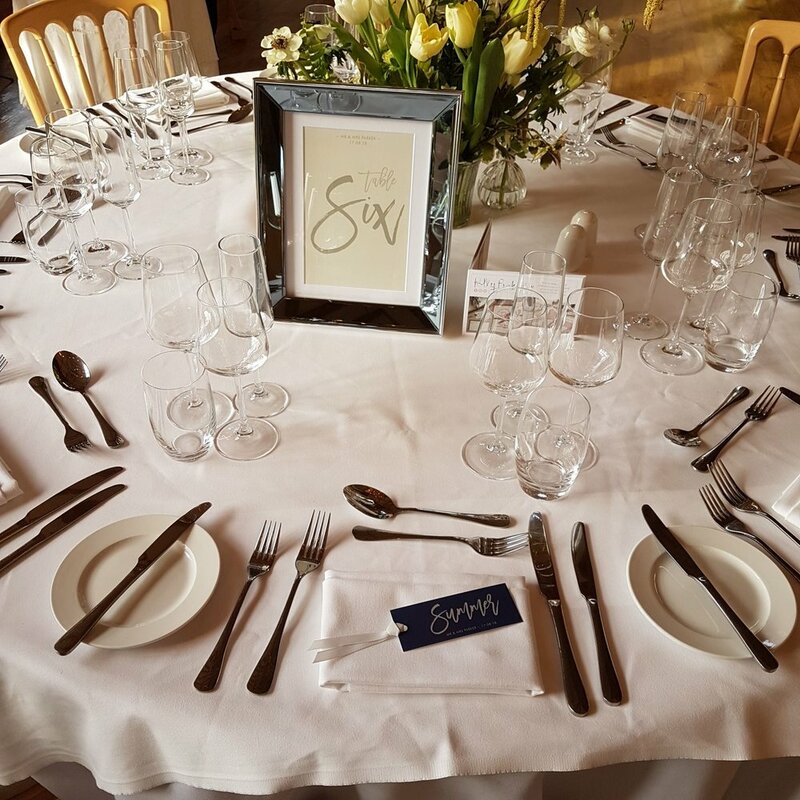 As some people had already booked their big day at Bruisyard, it was particularly nice to be able to picture where their wedding reception (and in some cases their ceremony) would be held. It enabled me to talk in detail with them about how they could incorporate one of my illustrations into their day. 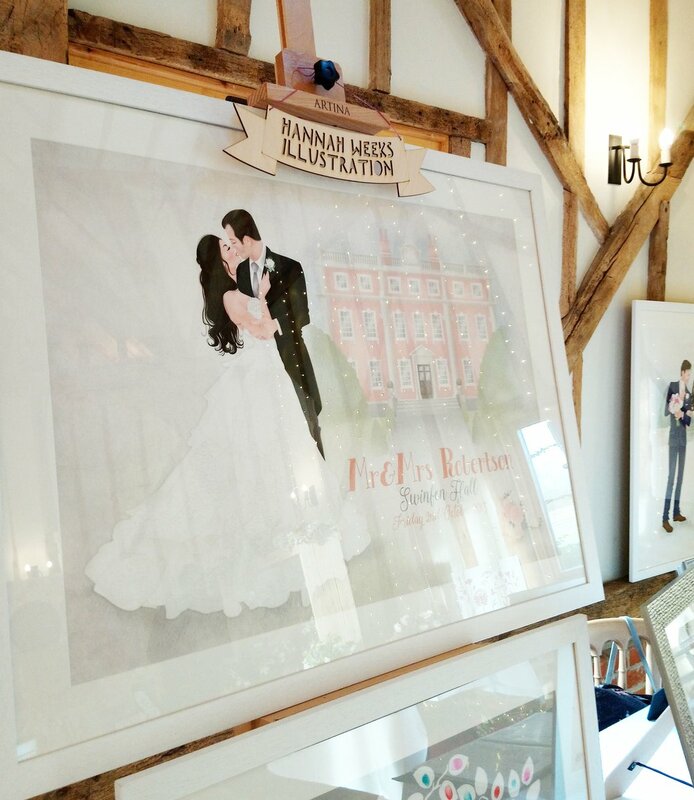 There's always a clear favourite piece when I exhibit my work at different wedding venues. This weekend's favourite was Bil and Richard's Italian wedding portrait (below). This was actually a wedding present that the couple's friends commissioned me to draw for them to give them a gift voucher for – it's still one of my favourite ever projects. My illustrated Table Plans were also very popular, and lots of the bride-to-bes asked me about these. I had fun catching up with lots of fellow, friendly wedding suppliers. 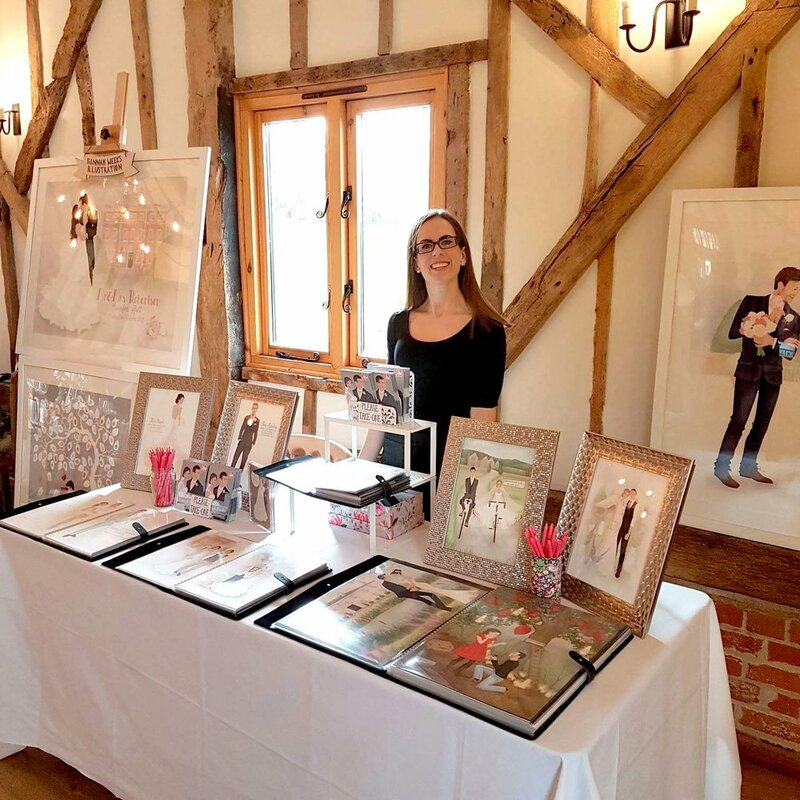 I always enjoy exchanging stories of wedding stationery we've been designing, with the very talented Gemma of Polly Pickles, and hearing about how Victoria Bradfield's MUA business has been going. I always giggle with Rashida of Lily Christina, because she likes checking to see if Tom's asked me to marry him yet! I think she just wants to see me in one of her amazing dresses (which are the most stunning gowns you've ever seen). I've got my fingers crossed for her that local boy, Ed Sheeran's, fiancé comes to her boutique for her wedding dress! Of course it was lovely to meet some new faces too - I will definitely be keeping in touch with fellow Stradbroke business owner Claire of Lavender & Jude and Debbie of Sassa's Bespoke Cakes, whose cakes are absolute works of art. The team at Bruisyard are absolutely excellent. They didn't stop working hard all day, busily showing people around, explaining how their wedding day would run smoothly, and serving drinks and (delicious) canapés. I want to say a big thank you to all the people that took the time to come and see what it is that I do. I always enjoy hearing what you are planning for your special day, and the different things you plan to incorporate. I had a great day, and very much hope to work with Bruisyard Hall and some of their brides again soon. You can see what other wedding venues I will be exhibiting at in Suffolk and Cambridgeshire here. Older PostPorridge - Five ways.